In the wild, adult female pandas give birth once a year and usually produce two cubs in the litter. Normally only one will survive. 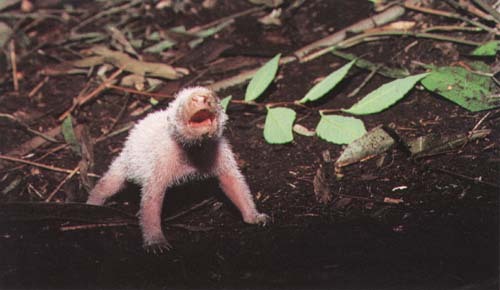 A newborn cub will weigh around 5 ounces is all white and blind at birth. The black spots develop after about a month. A cub will begin to eat bamboo at about six months and be fully weaned after nine months. At the end of the first year they are about 70 to 80 pounds. The cubs will stay with their mother for about 1 1/2 years.